Entitlement! This is the great limiter of the ability to take full responsibility. Most of you reading this live in one of the developed countries where you have had most things given to you without too much struggle. I know, I know, some of you are disagreeing with me about that! 🙂 and I would not even suggest that your life has been sugar sweet and completely easy. A life that is completely out of our control. We feel disempowered to live our dreams, our story remains that of lack, that of powerlessness and that of dissatisfaction. 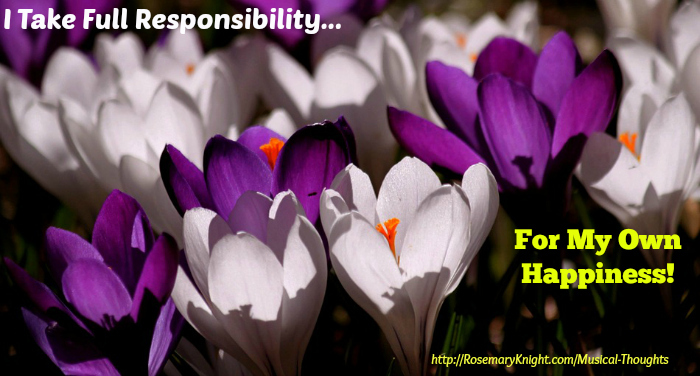 We are responsible even when we choose not to be. I am reading a book called The Big Leap and it is pretty amazing and eye opening. The core principle here is to conquer all your hidden fears and live in your core genius. We all have a place inside of us that is uniquely ours – when we act from that place, peace and prosperity ensue and this book encourages you to live out of that. Now, as the Mum in business, I have complete confidence in each of you and confidence in the power within each of you to live a life that pleases you. I have complete certainty that there is brilliance within you and this musical thought is to exhort you to take full responsibility for your own happiness. I can believe in you but you must choose to take responsibility for implementing the actions that allow you to live at your own peak level. I can not want your goals more than you do! Discarding Blame, Discarding complaining enables you to take back your personal power and start to create the life you really, truly want. Though it seems scary, when you choose to take full responsibility for your own happiness, possibilities begin to open up to you. And that is what you want really, right? Play with fire when it comes to setting Your Price Strategy & You Just might get Burnt!